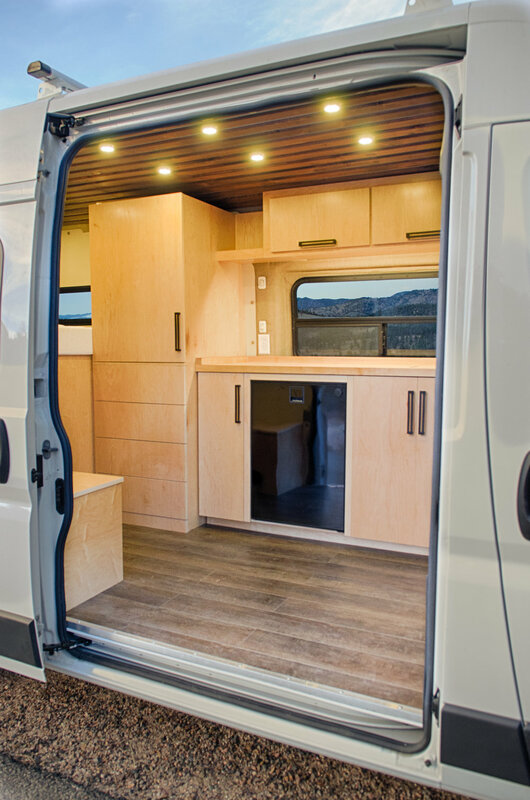 159” Promaster Campervan Converson: Mike chose his own interior finishes and created a clean, simple, and unique layout to enjoy for years to come! Open up the back of this adventure van and you'll find 300AH of Battleborn lithium battery power storage, bluetooth enabled Smartsolar controller, a 2000W Go-Power inverter, shore power option, and room for two full size mountain bikes via l-track mounted "Rocky Mounts". 10 LED puck lights on two zones illuminate the stained and slatted ceiling, along with the light weight custom maple cabinets mounted above the bed and kitchenette. A pair of Motion half slider windows were also installed above the bed on each side to compliment the Maxxair vent fan on cool summer days. Atop this Promaster conversion lies a roof rack that houses 300W of Renogy Eclipse solar panels to feed the Battleborn lithium battery storage in back. From here features such as the Isotherm 12v refrigerator, LED lighting, Espar diesel heater, and interior outlets are supplied with the power needed to go off grid for long periods of time. Motion windows line the outside of this van and supply plenty of fresh air through screened vents. A Maxxair 7500k vent fan lies above the elevated and steel framed 6" queen memory foam mattress to allow fresh air in during warm months (or to cool off from the Espar diesel heater during cold spells). Up close you can see black l-track giving the "Rocky Mounts" fork mounted bike mounts a secure mounting place. A 2" reciever also allows Mike to tow a small utility or toy trailer. The stained slatted ceiling, maple cabinetry, pulls/handles, and engineered wood floor were spec'd by Mike himself and installed with care. The tall closet features a hanging space as well as push loc drawers to give a modern feel. 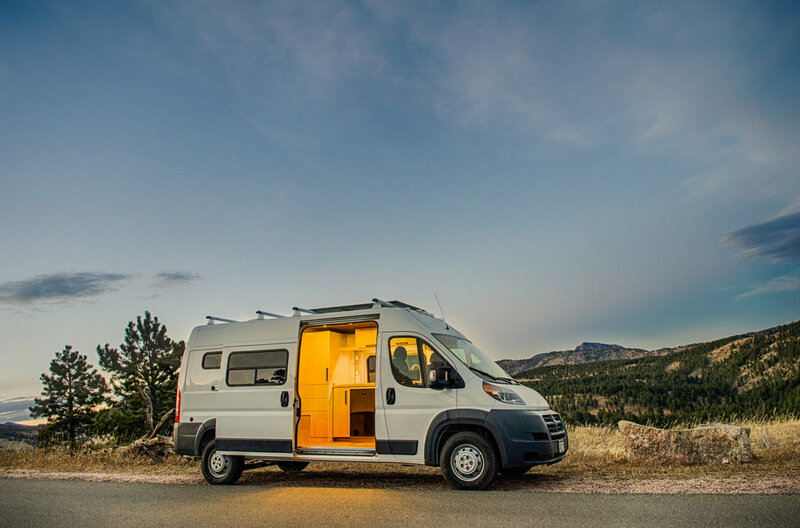 Mike's custom Promaster conversion has all of the features and storage for long weekends, or life on the road. We're thankful for the opportunity to make his dream van a reality!